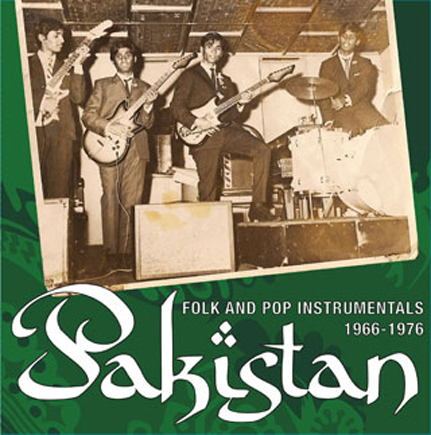 Spending the greater part of the last decade assembling this masterpiece while tracking down most of the musicians in the process, Stuart Ellis of Radiodiffusion Internasionaal has compiled a mind-blowing set of Pakistani instrumentals spanning the period between 1966 and 1976. It’s all here: rock and roll beat, surf, folk traditional mixed with pop, film tunes, electric guitars, sitar and organ solos, brilliant percussion and arrangements crafted by the grooviest bands of the period: The Panthers, The Mods, The Bugs, The Blue Birds, The Abstracts, The Aay Jays, The Fore Thoughts, Nisar Bazmi, and Sohail Rana. Situated between Afghanistan, India and Iran, the collision of cultural influences in Pakistan gave birth to music that was, and still is, unlike anything heard anywhere else on the planet. By the late 1960s, previous restrictions on musical expression began to soften and bands that were playing American and British pop covers became popular in Karachi’s burgeoning night club scene and at private dance parties. Long hair came into fashion among young men and hashish became the popular drug of choice on college campuses across Pakistan. Soon, hippies from both North America and Europe began flocking to Karachi, Lahore and Peshawar. Very few of the bands that formed during this time actually got to record. Like their neighbors in India, the Pakistani record industry was more focused on releasing “filmi” music, which had just started to incorporate the electric guitar and electric sitar. Pakistan’s musical revolution ended in June 1977 after a coup d’état and the establishment of a pure Islamic state governed by Sharia law. This marked the end of the “Swinging ‘70s” in Pakistan as night clubs and alcohol were banned throughout the country. Television and cinema, as well as popular music, were now subjected to government censorship. After the clamp down, many Pakistani musicians left the country and moved to America, Canada and England. The audio quality here is top notch, sourced straight from the original EMI Pakistan masters. This limited 2-LP set is housed in a heavy duty full-color gatefold jacket with superb photos of the musicians and extended liner notes by compiler Stuart Ellis.